Just a few days before I left for Italy, I went to Portland, OR to be with my daughter while she had surgery (totally successful and not major) and for the immediate recovery period. The day before, she and I went out to sketch together... she's a wonderful artist. 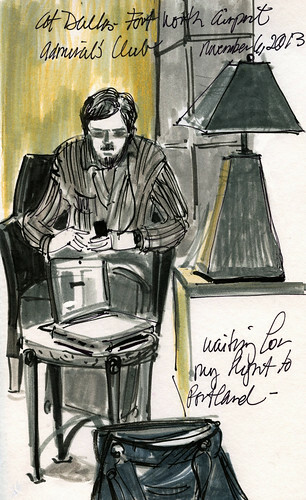 I had not had time to even look at these Portland sketches when I got back. But I have now added some color and scanned them, so here they are, in Cretacolor oil pencil, two kinds of brush pens, and Ecco pigment pen, with watercolor washes. Tiny glimpses of Portland, Oregon, voilà! Cecelia and I went to Oui Café to sketch and here are my two results. I always (after all these years still) surprise myself with how differently I respond, stylistically, depending on the drawing tool I am using. These two show that difference clearly. Jamison Square is near the hotel I stayed in. Cecelia and I first had affogatos at a nearby café and then we sat outside and drew.I was smitten with the bear and seal sculpture. Next up, more sketches from Italy. I am thoroughly enjoying this brief, quiet interlude between work and travel. Stay tuned, my buddies! 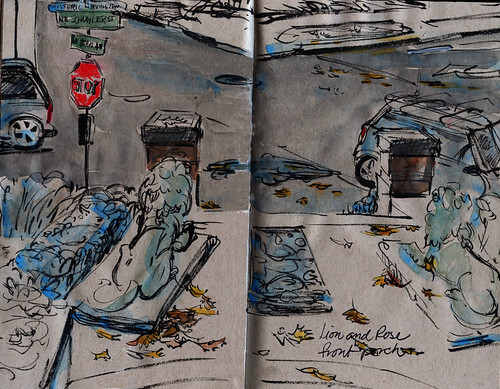 Here are two of the afore-mentioned Portland Urban Sketchers, having at it! 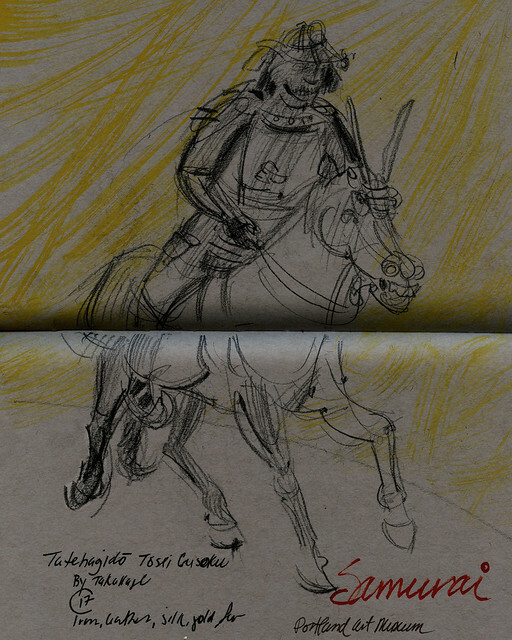 I had MORE fun with my Koh-i-noor Magic Pencil (see it in my New York sketches here). It comes in several colorways and the ones I don't have are on their magic way to me even as we speak! There is something so beguiling about the way color(s) appear as you draw, as if by (wait for it...) magic! I have just begun to explore the possibilities of this unique drawing instrument! One more drawing for today. I have several more to show, but don't want to clog up this post. I'll be back in a few days with the rest! So, as planned, in the same book with my Iceland and my Vancouver sketches went most of my recent Portland sketches. Atmospheric? Gray and wet...I call that atmosphere! Had a fabulous time with my Portland Urban Sketcher friends. 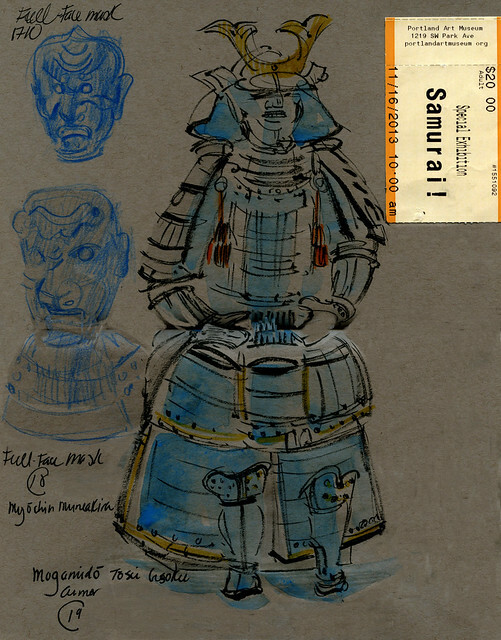 We went to see and draw the Samurai exhibit at the Portland Art Museum. Though it was indoors, it was plenty atmospheric. So much beautiful detail and drama to see in these artifacts of war and aggression. 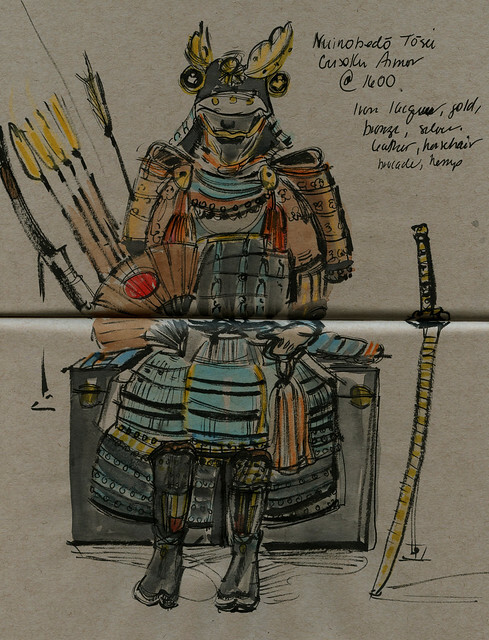 I have other museum sketches to share, but for today I'll just add these non-museum ones, one at the airport, and another from the front porch of my bed and breakfast, the Lion and Rose. I'm glad I got some sketching practice in before my Norway adventure... I was a bit wonky in these two. Live and learn. And learn and learn again. More to come!